Smith Magram Michaud Colonna, P.C. Innocent victims of negligence caused by car accidents, pedestrian accidents, motorcycle accidents leading to catastrophic injury and medical malpractice all have one thing in common - they need help. And they need it now. 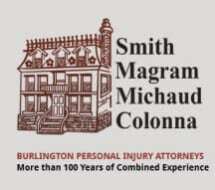 Our experienced Burlington, New Jersey, lawyers of Smith Magram Michaud Colonna, P.C. can provide the help - and hope - you are seeking. Our attorneys are sensitive to our clients' unique needs, thorough in our investigations and aggressive in courtrooms where an accident injury victim's financial compensation is often decided. We hold negligent drivers, manufacturers of defective products, doctors and nursing home operators accountable - in courts of law if necessary. You can depend on our accomplished legal team's more than 100 years of combined service to offer your best chance of success. Our reputation for results during that time bears out that claim. Case after case since our founding in 1965, we have consistently shown zero tolerance for insurers' delays or denials of benefits that victims of personal injury deserve. Our personal injury practice pursues maximum financial compensation for all that you have endured following an auto accident, motorcycle accident, slip-and-fall accident or bicycle or pedestrian accident. Our workers'compensation practice aggressively advocates for you if your employer and its insurer have failed to acknowledge your serious workplace accident injury. Our Social Security Disability practice excels in handling your appeal of a benefits denial, from original application to outcome. Our medical malpractice and nursing home abuse and neglect attorneys are your voice, in negotiations and in court, when a health care professional betrays your trust. Our Municipal Court practice protects your rights in cases of DWI, a traffic violation or miscellaneous misdemeanor. Smith, Magram, Berenato, Michaud, Colonna, P.C. If you are legitimately disabled but have not received Social Security Disability benefits you could benefit from the assistance of a skilled attorney. We work hard for the compensation you deserve. If another motorist's negligence caused a car crash that seriously injured you or ended the life of a loved one it can leave you with more damages than just physical. Hiring an attorney can protect your rights and give you the strength to go on. Depending on the circumstances you may be able to seek compensation from a third party that contributed to it. For example, an additional claim may be filed against multiple different parties for a construction site accident. Losing time on the job because of a disability can be a serious setback for any individual. Depending on the issue, it can have a tremendous impact on your family and life. Catastrophic injuries occur most often in motorcycle accidents and in dangerous workplaces. An experienced lawyer can evaluate your damages, investigate the accident and fight for you in negotiations with an insurance company.